Revlon Accent A01 False Eyelashes with FeatherLite Technology deliver stunning lashes that are less dense and lighter in weight than existing lash fibers. Revlon Accent A03 False Eyelashes with FeatherLite Technology deliver stunning lashes that are less dense and lighter in weight than existing lash fibers. Revlon Accent A04 False Eyelashes with FeatherLite Technology deliver stunning lashes that are less dense and lighter in weight than existing lash fibers. Revlon Accent A05 False Eyelashes with FeatherLite Technology deliver stunning lashes that are less dense and lighter in weight than existing lash fibers. Revlon Define D03 False Eyelashes with FeatherLite Technology deliver stunning lashes that are less dense and lighter in weight than existing lash fibers. Revlon Define D05 False Eyelashes with FeatherLite Technology deliver stunning lashes that are less dense and lighter in weight than existing lash fibers. Revlon Define D20 False Eyelashes with FeatherLite Technology deliver stunning lashes that are less dense and lighter in weight than existing lash fibers. 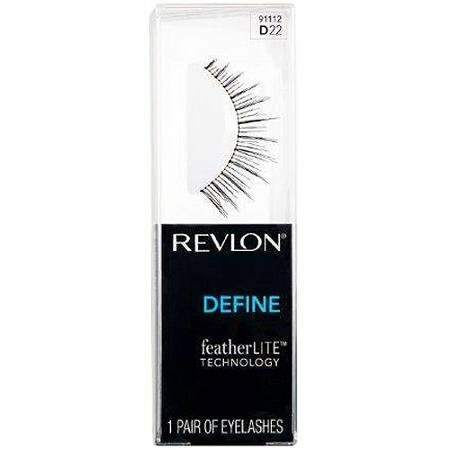 Revlon Define D22 False Eyelashes with FeatherLite Technology deliver stunning lashes that are less dense and lighter in weight than existing lash fibers. Revlon Define D40 False Eyelashes with FeatherLite Technology deliver stunning lashes that are less dense and lighter in weight than existing lash fibers. Revlon Define D63 False Eyelashes with FeatherLite Technology deliver stunning lashes that are less dense and lighter in weight than existing lash fibers. Revlon Lengthen L01 False Eyelashes with FeatherLite Technology deliver stunning lashes that are less dense and lighter in weight than existing lash fibers. Revlon Lengthen L03 False Eyelashes with FeatherLite Technology deliver stunning lashes that are less dense and lighter in weight than existing lash fibers.